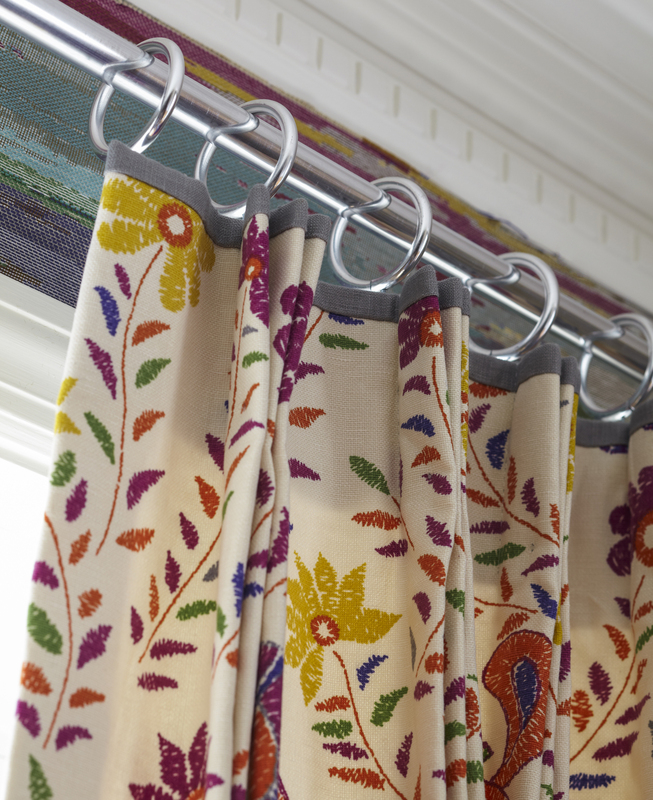 What's the most common mistake made by homeowners when buying window treatments? Getting proportions wrong. Scale and Proportion: What's the Difference? Scale refers to the size of an object compared to the space it's in. Proportion is about relationships. Are the different elements of a room — or a window — in harmony? This has a lot to do with the selection of a window treatment, advises our in-home consultant at Calico. Does the window treatment need to clear French doors? Protect from hot afternoon glare? Provide privacy? Or enable you to see a television or computer screen without an eyeshade? Understanding what the room requires will lead to the appropriate design solution. "Even in window treatments that are purely decorative, such as stationary side panels, the amount of fabric should approximate — not equal — the amount in a functional treatment or the end result may look skimpy," she suggests. Window treatments must be appropriate to the room: not overdone in a room that's short on architectural details, and not skimpy in a room of grand scale. Rooms with high ceilings offer more options. "However, if you don't have the height...discipline is required," advised designer Mark Hampton in his classic book, Mark Hampton on Decorating. "It's like being on a perpetual diet. Big valances and swooping swags are out," he noted. Fortunately, there are lovely window treatment styles for small-scale rooms using fan pleated draperies on small rods, or petite window swags and jabots, or Roman shades set within (or above) lovely moldings. The use of beautiful materials and careful workmanship will elevate the simplest design, stated Hampton. 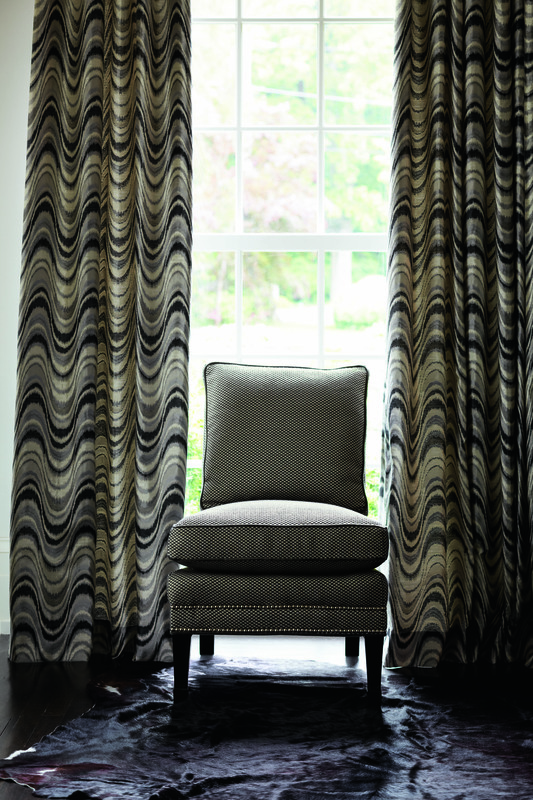 Fabrics must also be drappable enough for the chosen window treatment style. Most upholstery-weight fabrics don't have a soft enough hand for a swag, jabots, soft valances or shirring that all require natural drappability. 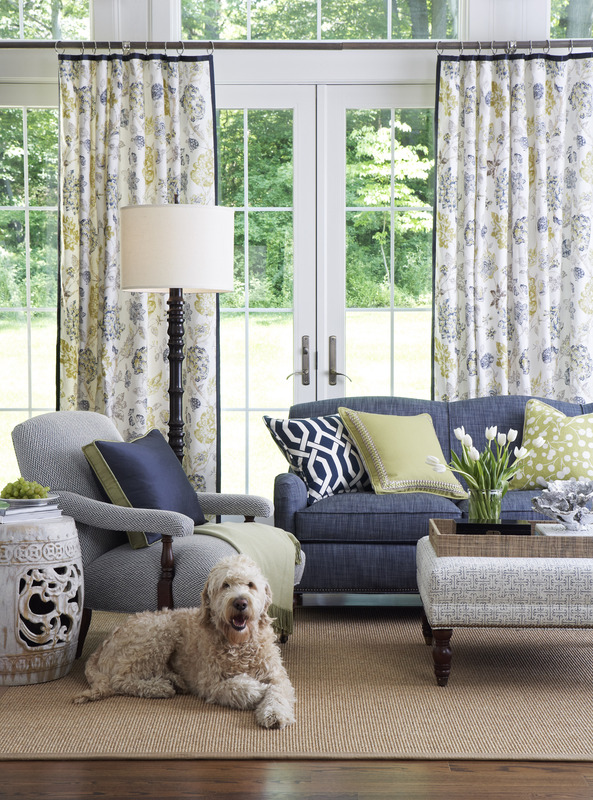 There are other, more tailored window treatments that work well with heavier fabrics. 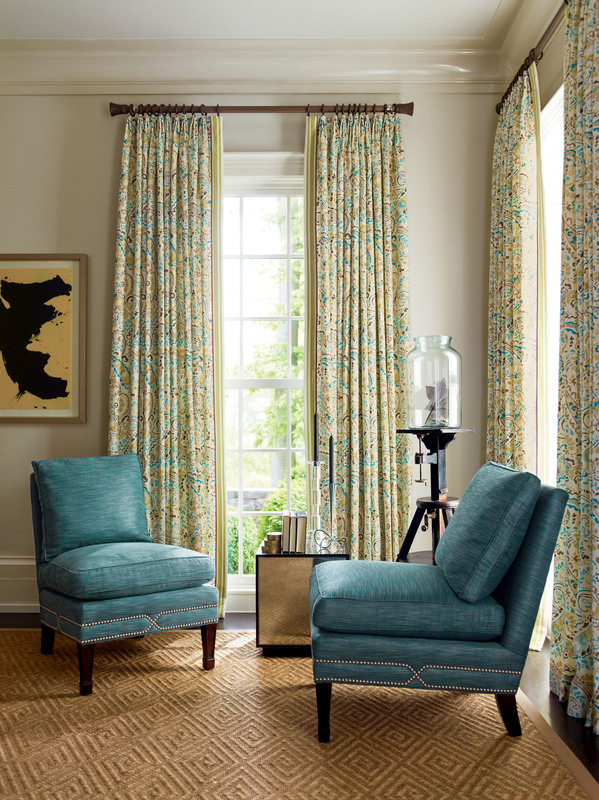 One width of 54-inch fabric pleats or shirrs down to about 18 inches — usually not enough for side drapery panels unless your windows are quite small, advises our in-home consultant at Calico in Dallas. For most windows, 1½ widths of fabric will make a more pleasing side panel — and for two-story banks of windows, at least two widths are needed. For functional window treatments that open and close, the width to be covered will dictate the number of fabric widths needed. Pay special attention to returns in a home with very high windows. Tall window treatments often need a deeper return to hang properly — at least 5½ inches for a single drapery (with no under drapery or sheers) and as much as 8-10 inches for really tall windows. 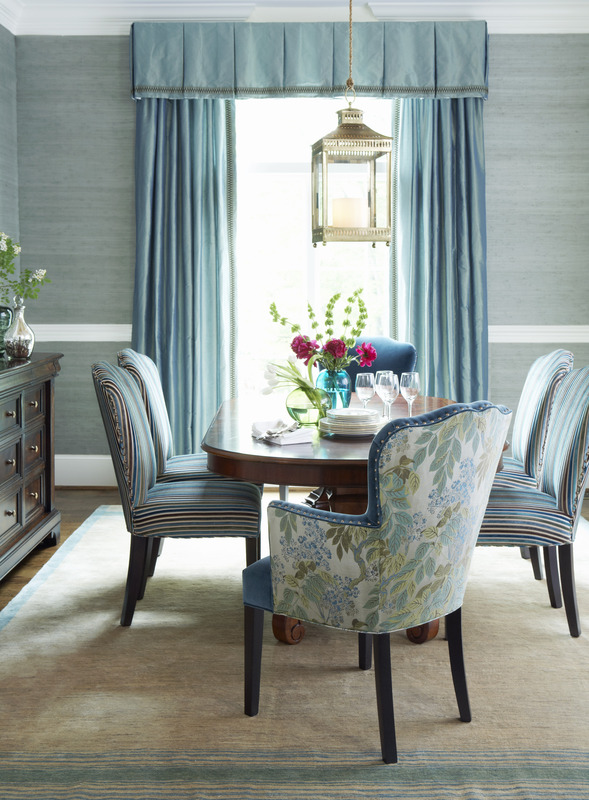 "Pulling the window treatment out from the wall on a large window enables the drapery to hang with deep pleats and folds that enhance the richness of the fabric," notes our Dallas in-home consultant. "Without that depth of return, the drapery will appear too flat." (Note: the return is the distance from the wall to the drapery — usually measured for a side bracket or rod support. Standard returns are 3½ inches). Small tight pleats — as in pencil pleated, pinch pleated or fan pleated draperies — are perfect for smaller-scale rooms. Conversely, pleats need to be over-size in very tall window treatments, at least 6-inches long. A too-short pleated drapery will look squat on a tall window treatment — and may even be hard to see. Calico offers a standard 4-inch pleated drapery in pinch, cartridge, goblet, butterfly and pencil pleats, plus a 3-inch mini-pleated drapery and a 6-inch oversize pleated drapery in some styles. Longer pleated draperies can be ordered for very large windows. Is there a rule-of-thumb for how long to make window valances, cornices and other window top treatments? Not a hard and fast rule, but there are guidelines. Start with the Rule of Fifth or Sixths: divide the finished length of your drapery by five or six to determine the approximate finished length of a valance or swag. 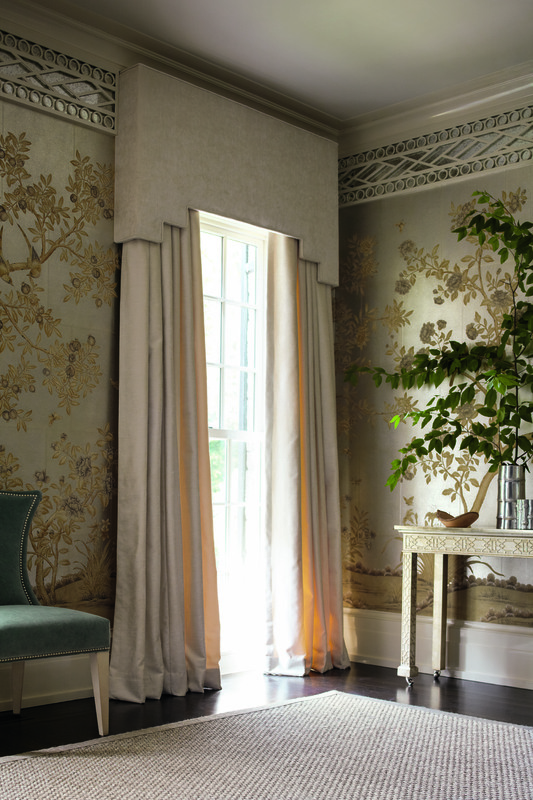 For example, a drapery with a finished length of 100" might have a window valance that is 16" (1/6) to 20" (1/5) long. For window treatments mounted just over the window, use the smaller figure; for window treatments that will hang near the ceiling, use the larger figure. However, there are many factors that might fudge the answer — the height of the ceiling, the number of windows in the room, the presence of moldings, the proportions of the window, the pattern in the fabric or the desire for light — not to mention personal preference! Our in-home consultants sometimes recommend taking brown kraft paper or newspaper, folding it to a window valance size and taping it to the wall area above a window. Stand back, squint your eyes, and you'll begin to read the volume of space a window valance would occupy. Should it be a little more or less? Do you want to take it up close to any molding to maximize room height and get more punch from the fabric? Or will it look top-heavy? Play with folding your paper window cornice or valance until it seems right. The window valance should cover the header (pleats or shirring) of the drapery, the hardware and the frame of the window. A very wide window may require a somewhat deeper valance to be in proportion to the draperies on each side. If making a shaped window valance or cornice, the longer it is, the more variation you need between the short and long points of the design. "A customer was having cornices made for her 20-foot high windows," recalls one in-home consultant. "We specified a long point of 30-inches on the cornice and when they came into the store, I was afraid that we'd made a terrible mistake. However, once they were installed, the cornices were perfect — and they had to be that size in order to look appropriate capping these very high windows." With the variety of drapery rods available these days — from diminutive to grand in scale — it's easy to find the right window hardware to finish off the window. The size of the room, the height of the windows and the scale of the treatment will suggest the appropriate drapery rods and rings. A twisted length of wrought iron rod will look great in a standard-height room, but not hefty enough in a large room with vaulted ceilings and huge windows. Window Hardware. Remember the Golden Mean (if not from geometry class, from the Da Vinci Code)? The ancient Greeks discovered the mathematical basis for pleasing proportions of shapes and spaces — from buildings to objects, from fashion to window treatments. You can also think of the length of the drapery in units of five — and place tiebacks down two units from the tip or up two units from the bottom — leaving three units on the other side. This is also within the Golden Mean. Educating your eye about scale and proportion will be useful throughout your life — in everything from gardening to cooking to fashion, and of course, home decorating.